I love eating hot cross buns at Easter. Well, to be more precise, I love BAKING hot cross buns at Easter. Little A and Big A are not big fans of hot cross buns. They don’t like the dried fruits for starters, and spend all of their time picking them out. They don’t really go in for spices and sweet buns, either. And I try not to eat too much bread as it doesn’t really agree with me very well. So I don’t actually buy or eat many hot cross buns in the lead-up to Easter. But I love the smell of hot cross buns freshly baked, just out of the oven. And I love baking for friends. So every year on Good Friday I make hot cross buns. It is a bit of a process to make them so that they are ready for breakfast. I prepare the dough the night before, usually two batches just to make extra. And then I refrigerate overnight, and get up before 6.00am on Good Friday to mould them into round balls and allow them to rise. Hot cross bun dough – I forgot to add the dried fruit in the breadmaker, so incorporated by hand later. This year I tried to experiment with a new recipe using Herman the German sour dough. I allowed the dough it to prove for three and a half hours, rested it in the fridge overnight, then prove another six hours. It still experienced failure to rise. “It like dense German bread,” said someone. “Sure, I’ll keep some for you,” I promised. But not even lovers of pumpernickel could quite chew those buns. So, I went back to my tried and true recipe, a variation of which I first blogged about on my Taiwanxifu site. Being back in Australia and able to buy lots of baking ingredients I used currants, as I prefer them to sultanas, and mixed in a few cranberries. 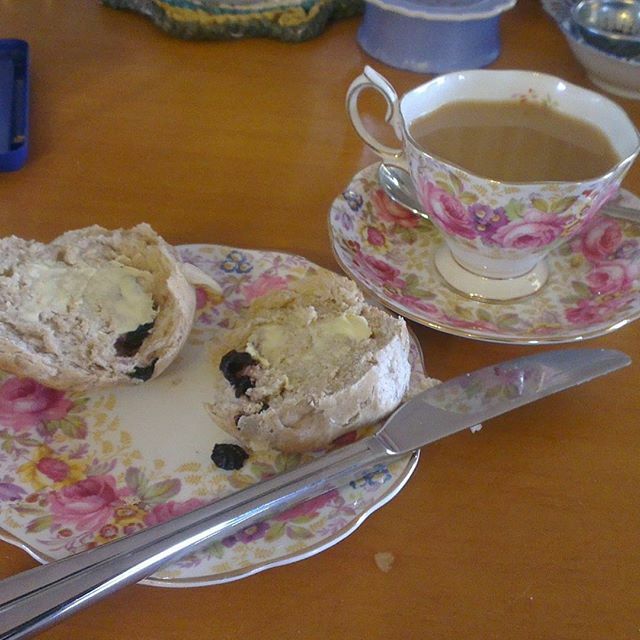 This time my hot cross buns rose perfectly, and we enjoyed hot cross buns while drinking tea in my favourite China teacups, listening to a beautiful piano rendition of Amazing Grace. I baked too many, so dropped off some to neighbours and friends. Later we went to a friend’s place for a lazy potluck lunch. I didn’t bring any hot cross buns, thinking there would be heaps, but regretted not taking some as friends had seen them on Facebook and Instagram and asked about them. Next time! You don’t need to get up at the crack of dawn like I did. Easter can be a lovely family time and a good opportunity for baking. Try making these together with your family. Happy Easter and happy baking! Pour the water into the bottom of the breadmaker. Add the butter and salt. Measure out the flour, and spoon on top. Add in the remaining dry ingredients, except for the dried fruit, adding the yeast last. Select the ‘dough’ cycle for the breadmaker (around 90 minutes). When the breadmaker beeps (usually after around 15 to 20 minutes) add in the dried fruit. (I added mine in by hand at the end, but I think it is easier to do so in the breadmaker). Once the dough cycle has finished, the dough can be refrigerated overnight in a plastic bag or in a bowl covered with a damp cloth. Cut the dough into two pieces, and roll into a log. Cut into two, then cut each section into three pieces (i.e. the idea is to make a dozen hot cross buns). Form each piece into a ball, and put on a baking sheet. Cover with gladwrap (or a damp teatowel) and allow to rise for at least an hour. Set the oven to 160-170C (my oven is very hot) to reheat it. Combine flour and water to make a paste, then spoon into a ziplock bag. Cut off one corner with scissors, and then use it to pipe crosses onto the buns. Bake until golden. As soon as they come out of the oven, brush with the gelatine/sugar mixture. I love the sizzling sound the buns make as you brush on this glaze, and the way it deepens the colours of the buns. Cost (based predominately on ALDI prices). Triple batch! Wow! I got to enjoy the hospitality of a good friend yesterday – sounds like you had quite a party. Beck @ Goldenpudding sometimes it is more fun to stay at home and enjoy the blessings of being with friends and family. 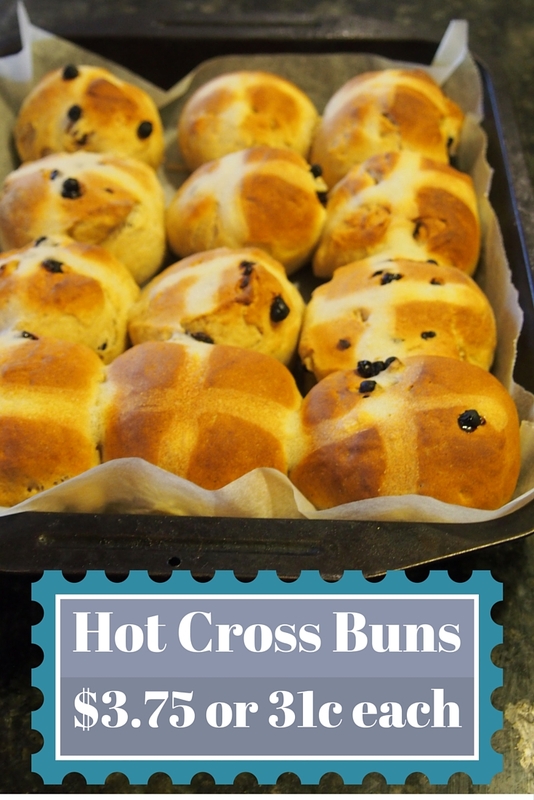 Love hot cross buns but have not tried to make them. I am a savoury cook, whereas my husband does the bakery. Lucky you with a husband who is good with baking:) Happy Easter. Happy Easter, and I am glad the recipe resonated with you. There are a lot of fancy hot cross buns around, but sometimes I think the simplest is the best. The only times our household made hot cross buns are when the girls’ fun uncle is in town. I really should try and make them some time! Thanks for the recipe. I’m sure you are a fun mum as well! They aren’t so daunting to make. The only trick is getting them reading in time for breakfast. If you are not fussed about eating them for afternoon tea you don’t need to get up before dawn like I did. I haven’t attempted making them since I worked at Hotel Realm 5 years ago, the executive chef was brutal, I spent hours working on them and he walks up and says – sh!t, and threw them in the bin. No explanation what was wrong with them. Sigh! So I haven’t gone back to try and prove him wrong since. Haha! Very mature. These buns look delicious, though it is funny to read that not everyone in your home is a big fan:) Lucky all the people you are baking for, they will surely have a delicious Easter. Yum! Wow, my hubby isn’t a fan of hot crossed buns either, but these look great. I really want to make them!! Thanks!